Winter weather is either on its way, or already here depending on where you live. With winter comes snow and freezing temperatures, so it’s time to prepare yourselves and your pets for the new season. 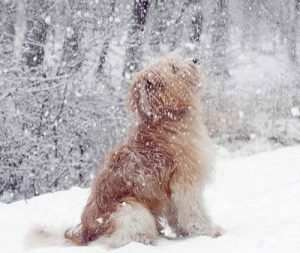 While the weather outside is frightful, these winter pet tips can keep your precious pets snug, safe, and warm. When is it time to bring your pets inside? 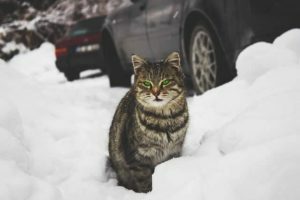 Unless your pet is a breed that is heavily coated and accustomed to living in cold environments, when the temperature falls below 32 degrees Fahrenheit it is time to provide shelter for them to keep them safe from frostbite and hypothermia. Just remember, if it’s too cold for you, it’s too cold for your pet. What if I cannot bring my pet inside? If not in your home, then make a warm place for them in your garage. Dog houses can provide shelter, but bedding such as self warming pet pads and other insulating material should be provided. Check their water frequently and feed them more than normal as they will need the fuel to keep themselves warm. Keeping Your Pet Warm: Many people misunderstand an animal’s coat of fur. Although it may be plush and beautiful, it is not always the perfect insulator, and if your pet has short-hair or hairless, they are even more vulnerable to the cold. To help prepare your pet for warmth, start with a dry, draft-free shelter with plenty of food and water. Pet Clothes: Good or Bad Idea: The real answer is: It depends. There is nothing wrong with dressing your dog for the season, as long as it does not inhibit breathing or movement. Cute clothes for cats are usually not a good idea. They are more stubborn than dogs and could actually do more harm than good. In cold weather, keep cats (even outdoor ones) inside with a warm blanket and they should be fine. Keep the Outdoor Adventurers Inside: If you have a dog that spends most of its time romping in your backyard, or a kitty that whiles away the day in a sunny patch on the front porch, winter’s arrival may be a rude awakening. Pets are at risk of getting frostbite or hypothermia just like a human. If your pet has been playing in the snow, make sure to protect their paws from salt or antifreeze spills with booties or petroleum jelly before they go out. Very important to clean their paws, ears and coat when returning inside. Tis the Season for Poisons: Coolant and/or Anti-freeze can spill in the parking lot, garage or driveway and are EXTREMELY poisonous to pets. Unfortunately, dogs love the smell and taste. So, it is important to keep an eye on them when around these areas. Wipe paws, legs and stomach when returning from the rain, sleet, or ice. Save a Cat: Cats love to be warm and cozy, especially in the winter. Since they don’t know any better, what better place than an engine compartment? This unfortunate accident causes numerous cat deaths a year. Save a life this year by banging loudly on your hood. This will give any sleeping cats a chance to vacate before turning over the motor. It doesn’t take much to keep our pets safe when things get frosty. Just like us, our feline and canine friends need shelter, warmth, food, and care. When winter’s chill sends you scurrying indoors, don’t forget your furry four-footed pals and their simple needs this season. Thanks for sharing such great article about cats. The social adaptations of pets and humans are similar enough that cats can live perfectly happy lives surrounded by humans and vice versa. Pets are pampered with the best of food and medical care, frequently have a rest in their owners’ comfortable beds. Melody – your pet’s microchip IS should not be a problem with TSA as it does not transmit anything unless it is scanned. They may ask you to remove it while you pass through the scanner with your pet, but they will not confiscate it. Will the micro chip ID in our dog be a problem with TSA?